Tonight was a very exciting night. We bid farewell to SP's 1999 Honda Civic (purchased in 1998) and said hello to a beautiful new 2010 Honda Civic. 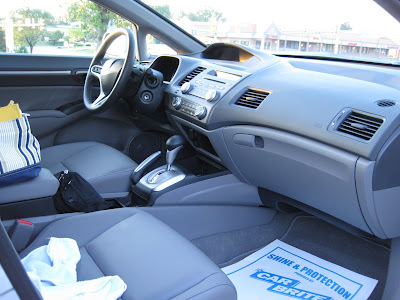 The new one is also silver, also with gray interior. What can I say - we like silver cars! When we're inside the car, it feels like we are in the lap of luxury: It's not too hard to feel like you're in the lap of luxury when you bid farewell to a dirty, stained interior and say hello to a smooth, sleek, clean interior! Old Honda was having yet another issue and we decided it was time to stop sinking money into Old Honda. It's time for New Honda and monthly payments for the next 5 years. Yikes, monthly car payment. That's depressing, and a hit to the budget, but it's soooo nice to have a new car! Hopefully New Honda will have as long a life as Old Honda. After signing all the paperwork and getting the keys to the shiny new toy, we spent some time adjusting the seats and mirrors (SP) and programming the radio (me). SP doesn't like how I programmed it. Oh well. Then we headed off to dinner with SP's dad at a pizza/Italian place in McMurray: Grande Italian Restaurant. We had not heard of this place before but SP's dad has eaten their pizza several times. The interior of Grande is a typical pizza joint/diner interior. Lots of green, red, and white. Lots of booths and just a couple of tables. The servers are very friendly and laid back. There's a lot of options on the menu. There's lots of pasta dishes, stromboli, calzones, sandwiches, pizzas, soups, salads, appetizers, meat & seafood entrees - goodness there was a lot to read! We ordered iced teas and lemonades while we perused the menu. The iced tea is fresh brewed - yay! 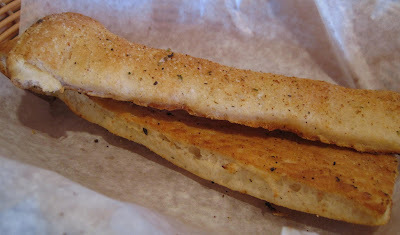 While we considered our options, we were served tasty, seasoned breadsticks. 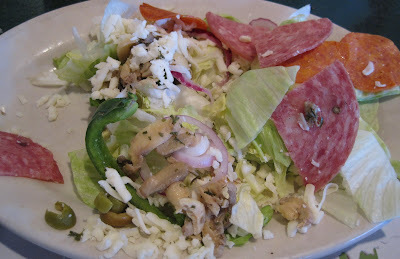 We started off with an Italian Antipasto Salad: It was tasty and the 3 of us devoured it. Shredded cheese, meats, iceberg lettuce, olives, onions, green pepper, mushrooms and served with an Italian dressing. We decided to share an extra large 18" (16 cut) Neopolitan style pizza topped with roasted red peppers, sausage, and mushrooms. It was enormous! The mushrooms are canned mushrooms, but Grande adds their own seasonings to the mushrooms and they are quite tasty. The toppings are very generous - nothing skimpy here. It's a very thin crust pizza and the center did get kind of wet/mushy from the wetness of the toppings, but the outer crust was very. very good. 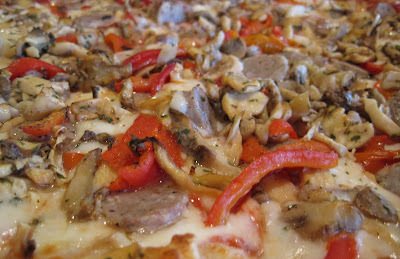 Here's a closer view of the toppings: The sausage was very tasty. Not the usual slightly spicy Italian sausage crumbles but rather sliced rounds of a mild yet flavorful sausage. 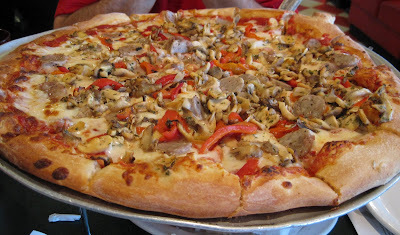 We were very pleased with the taste of this pizza and would definitely get their pizza again. It's also very filling because of the generous quantity of the toppings. My friend L, who lives in McMurray, says she hasn't tried Grande yet but is now looking forward to it, especially since it's a kid friendly place (and her kids love pizza). SP & I didn't even know this place existed until SP's dad suggested it tonight. When we graduated high school and left McMurray, a lot of the strip malls and restaurants and other places south of Donaldson's Crossroads were not there. Even though we are frequently back in McMurray, we have only a vague idea of what is in each of the shopping areas. We should start paying more attention and exploring a bit because this was a great find! After dinner, we took the long way home so we could enjoy the new car. I'm looking forward to my next ride in it. yay new car! i love the 2010 civic. we know a couple who have two. is it strange that i like canned mushrooms for pizza? i'll have to keep grande in mind next time we're out that way.